Wow! It’s December already? My mother always told us that the first words out of your mouth on the first of every month should be “Rabbit, rabbit” to bring you luck, so there it is. This week’s choice for Cook the Book Fridays is Celeriac (aka Celery Root) again! I enjoyed the Celery Root Soup we made in November, and this celery root gratin did not disappoint. Fortunately, I still have a few bulbs left from last month’s supply, straight from the farm, so I was prepared for the task of making Celery Root Rémoulade. The base is a tangy dressing made from mayonnaise, a combination of crème fraîche and sour cream, Dijon and whole-grain mustard and lemon juice. Ooh-la-la! The most challenging part is to peel and julienne the celery root. Carefully peeling with a knife is not that hard. Unfortunately, my celery roots had some woody parts inside, so the next step of slicing into tiny sticks was a bit tedious because I had to take time to cut out those woody sections. I was in a bit of a hurry and just mixed all the celery root I’d cut into the full amount of dressing. I used less celery root than called for which resulted in an overly creamy salad. This could easily be remedied by adding more celery root or only mixing in the amount of dressing needed to coat. I also forgot to add the parsley which would add an extra freshness and some color. 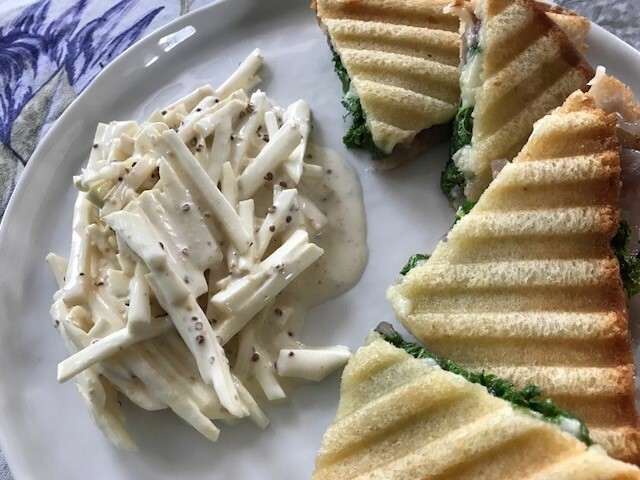 Despite my shortcomings in following the directions, the celery root rémoulade is a delicious salad, one that I would enjoy again and again. It was the perfect foil to a grilled Cheddar, caramelized onion, and kale sandwich! My new trick with grilled cheese is to lightly coat the OUTSIDE of the bread with mayonnaise instead of butter. It’s much easier to spread and browns up beautifully. Why was I in a hurry? I was trying to mix up the salad before I headed out to meet Tricia (daughter of Chez Nana’s Ro) to attend a demo and tasting with David Tanis. 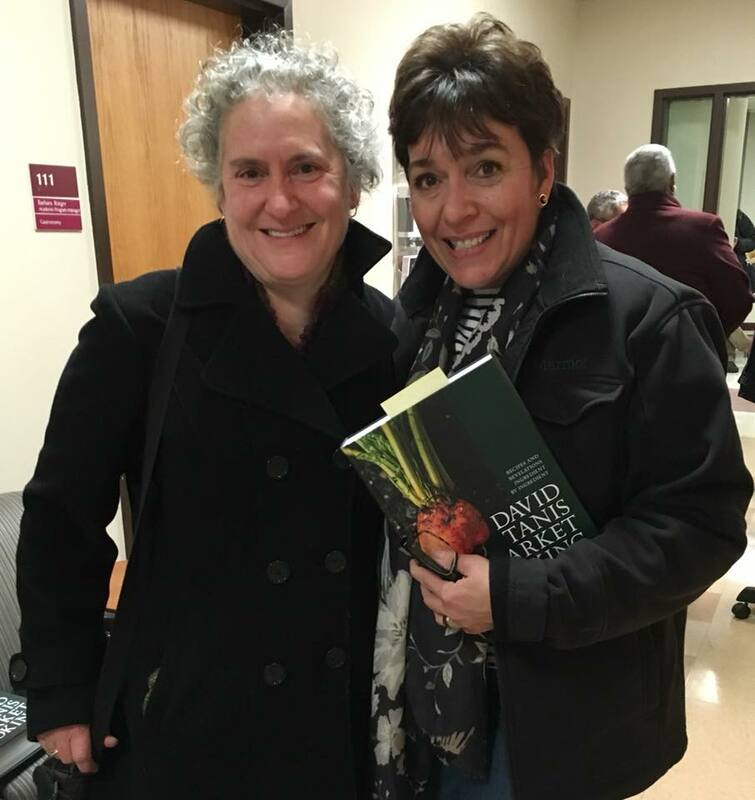 The event was part of the book tour for his newest cookbook David Tanis Market Cooking: Recipes and Revelations, Ingredient by Ingredient which was released in October. The book is filled with straightforward recipes and ideas to prepare fresh seasonal produce from your local farmers’ market. Most (maybe all) of the recipes are accompanied by photographs, so it is a beautiful book in addition to being inspiring. For about two hours, he talked about cooking, his cooking life, as he demonstrated a selection of recipes from the book. Students of Boston University’s culinary program had worked all day with Chef David to prepare the recipes, and as we watched and listened to the presentation, we were served tastings. The menu included Shrimp with Tomatoes and Feta, Onion and Bacon Tart, Cumin Lamb Pitas, and a Rustic French Apple Tart. These recipes resonated with my own sensibilities about cooking, so I left inspired to try my hand at these and many other recipes in the book. Check out this new book which has its own variation on celery root rémoulade! If you want to try celery root salad yourself, the recipe is on page 105 of David Lebovitz’s My Paris Kitchen. My Cook the Book Fridays friends’ reviews of the same recipe can be found here. Posted on 1 December 2017, in Books, Cook The Book Fridays, Farmers Market, my paris kitchen and tagged celery root, Cook The Book Fridays, David Tanis, my paris kitchen. Bookmark the permalink. 6 Comments. Rabbit, rabbit. It’s always so interesting to hear the story behind the cooking. The demo and tasting event by David Tanis sounds awesome. Loving this post! I couldn’t segue from the Celery Root Rémoulade to the Rabbit! Rabbit! very easily so gladyou cleared that up. Probably the first of every month, I will add that to my Day 1 and think of your Mom. I made the soup this week but will do the Rémoulade in December. I am really anxious to try the dressing. Everyone’s photos look beautiful. Glad you had fun with Tricia and a good night with Tanis. I like reading his column in the Times and have his Fig cookbook. Unfortunately I haven’t made many recipes from him. Will remedy that. So wonderful to see you and Tricia together (and the book is awesome!). You were so patient to chop your celeraic – grater all the way for me! I’m glad you and Tricia enjoyed the demo and tasting, I would have loved to be able to join you both. I have also tried mayo when making grilled cheese sandwiches, it works beautifully. Your salad looks great. 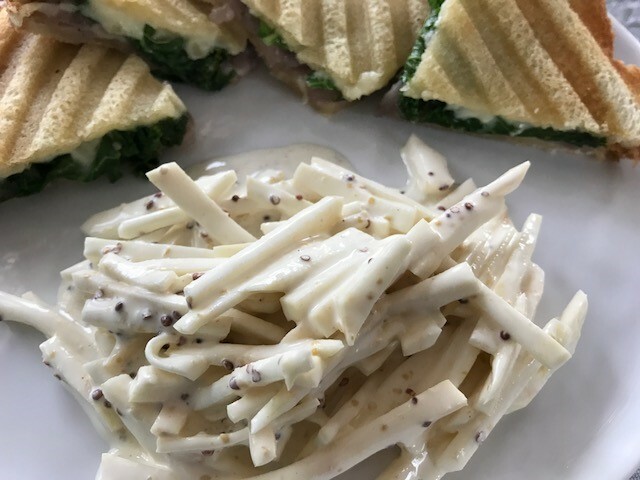 I think when I make it again I would like to try grating the celery root to see if there is a difference in the taste and perhaps easier to eat. That’s so quaint, that memory tid-bit from your mother, thanks for sharing! I had the last of the salad with a Zongzi!